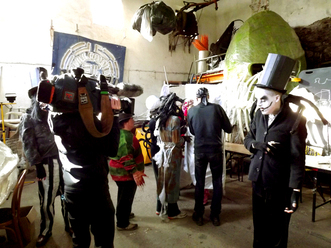 RTE Nationwide spent the day filming with us earlier in the month. 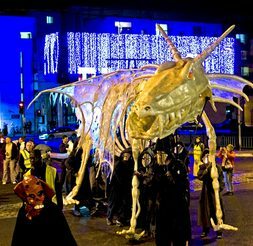 For those of you who can't make it to Cork to join in the fun of the 6th Dragon of Shandon you can view the build up to the event and some footage from last years parade on RTE 31st October at 7pm. Howls and wails, screams and cackles!!! Singers and loudmouths are invited to join a choir with a difference as part of the Dragon of Shandon. A short workshop on the day will take place with sound designer Rumhann Howard-Hildige and the choir will be facepainted and dressed in black as part of the parade theme. Please email vocalcork@gmail.com or text 087 3900267 if you are interested in taking part. 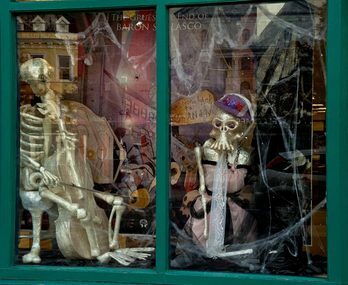 In the build up to the parade on the 31st we have installed a freaky Samhain window display in the Failte Ireland Tourist Office on Grand Parade. Many thanks to the guys from the Arts Administration course in Stiofan Naofa who worked on the props and installed the finished display with Cork Community Art Link. 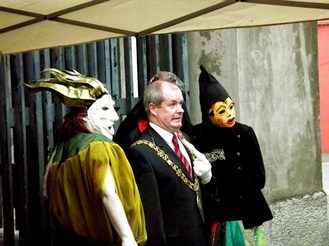 Lord Mayor Councillor Terry Shannon launched this years Dragon of Shandon on Tuesday evening. It was great to see so much support for this years event with over 100 people attending to get a sneak peek of this years parade. Thanks to Cliona Moynihan Downes from theButtercup Cafe who supplied attendees with gorgeous pumpkin soup and homemade brown bread and the Butter Museum who supplied us with the butter for the bread from their afternoon butter making demonstration. Additional thanks to Estelle and Alison who entertained the crowds with a violin and cello duo. 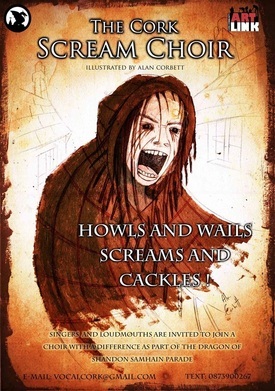 Copies of Alan Corbett's mini comic "The Grusome End of Baron Spolasco" were unveiled and are now available to purchase priced 2 euros and sets the background to why Spolaso is returning to Cork and what may happen when he encounters the Dragon of Shandon! For this year's parade, Rachel Healy (workshop leader for drumming in Cork Music Works) will work with Carolyn Goodwin (brass teacher in Cork Music Works) as musical arrangers and with the Knocknaheeny Youth Music Initiative, bringing a group composed of around 30 musicians to the streets of Shandon for the night. 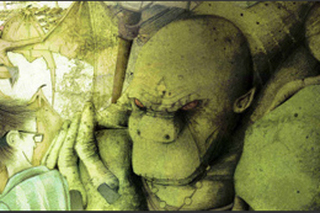 Rumhann Howard-Hildige is a digital artist specialising in animation, photography and film. But his skills reach far beyond that and he will create the soundtrack for the performances happening at the begining and at the end of the show. The Butter Exchange Brass Band, or the “Buttera” as it is known, is one the best-known brass and reed bands in the city of Cork. The band was established in 1878 but has roots in a small band established for religious purposes by Fr. John McNamara, a curate of the North Cathedral. 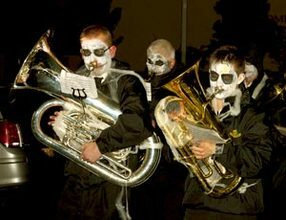 This will be their second participation in a row in the Dragon of Shandon Samhain Parade. 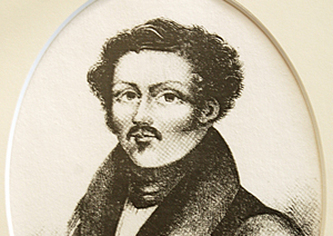 Baron Spolasco spent some time in Cork in the early 1800’s. He claimed to have the expertise to cure everything, and diagnosed disease just by looking into people eyes. Two manslaughter trials later, he ran away with the money of the gullible ones. This year’s storyline will feature Spolasco's mischief and his fearful encounter with the Dragon itself. 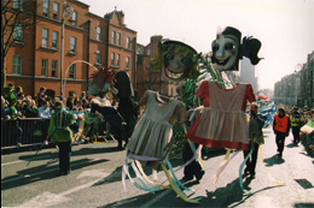 Three workshops have already started in regards to the parade with School Completion Project working on masks, costume and performances while Blarney Street Youth Project will develop a drama piece with falling angels. 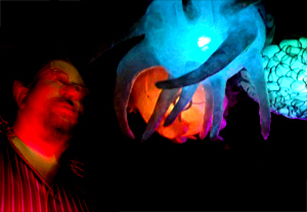 Cope Foundation is developing a very funny nighmare visual piece to be performed while moving along the streets. 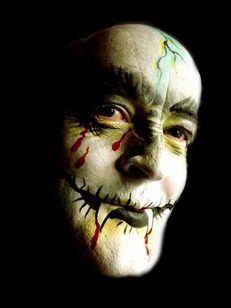 Talented cork based illustrator, comic artist and graphic novelist, Alan Corbett, joins the team of the Dragon of Shandon, to create visuals that will be used to promote the Samhain parade. Copies of Alan Corbett's illustrated mini comic The Gruesome End of Baron Spolasco will be available to purchase on the night of the parade. 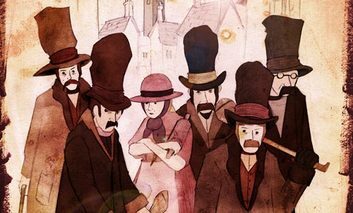 This wonderful mini comic tells the story of 19th Century quack doctor Baron Spolasco who practiced in Cork in the 19th Century, his reasons for leaving and what awaits him on his return. Priced €2 its a bargin! We were delighted to have Maria Mullarkey and Seamus O Suilleabhain from Nationwide who spent the day with us filming preparations for the parade. 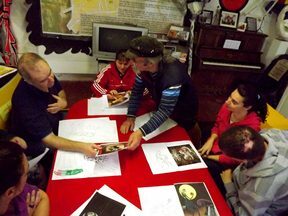 Amongst the workshops they attended were The Cope Foundation rehearsal, masking making with the boys from The School Completion Programme and a dress rehearsal with the Blarney Street Youth Club. The programme will air on Monday the 31st of October, so if you can't make it to the parade be sure to tune in to see what you're missing. And of course if you are joining us for the Dragon of Shandon Parade then you'll just have to press record! 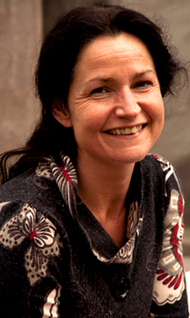 Francesca Castellano will be creating costumes for no less than six participating groups, Gurranabraher, Blarney, Shandon, North Press, Firkin Crane and Artlink drama group, which represents over 80 people altogether. 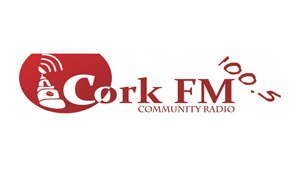 Cork FM Community Radio invited us on their Arts Programme last Sunday 2nd October 2011 to talk about the Dragon of Shandon. A major new feature for this year event will be colorful illumination on moving props and puppets. This will be made possible thanks to our volunteer Dominic O Callaghan. Dominic heard of the parade and simply knocked on our door to see how he could get involved in it. 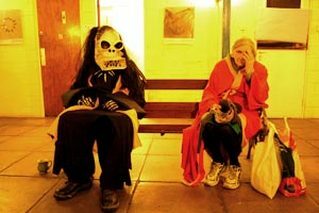 Without revealing too much we can advice people to keep their eyes on the river Lee for Halloween night, and to follow his example by calling in. 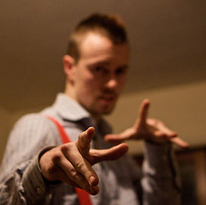 Cork based Director and Multimedia artist, Fernando Tunon will be in charge of the free Drama workshop that will lead to the opening, middle and closing scenes for the Samhain Parade. If you want to shine on the night, just call in every Tuesday from 7PM to 9 PM at 107 Shandon Street. 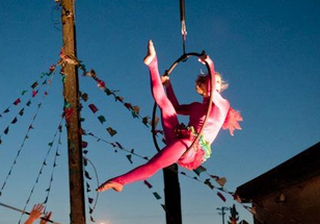 Once again, Cork based dancer, choregrapher and aerial artist Chloe de Buyl Pisco will be involved in the Dragon of Shandon. She has brought dance performances into the event for five years in a row, and will be in charge of the opening dance scene with Cathedral Cairde Shandon Street Youth Club. Chloe will be working on the animation to be projected for the opening sequence of the Samhain Parade. Chloe is a Cork based graphic designer and animator. 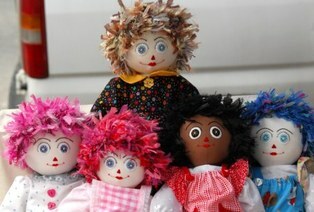 She created this short stop-motion film within Cork Community Art Link workshops.